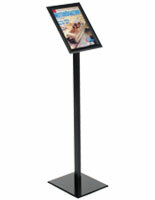 Snap Frames : This floor standing sign features a snap open frame for quick graphic changes. 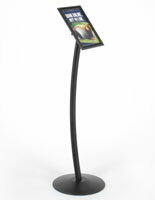 Standard Sizing is for 8-1/2" x 11"
Quick graphics changes are a SNAP! 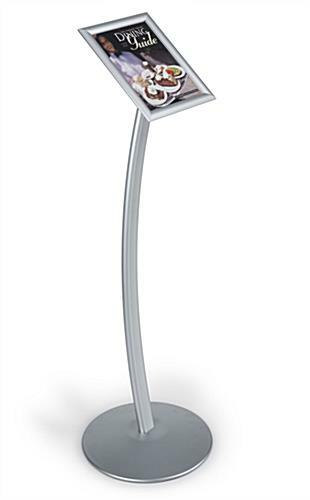 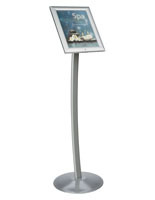 Designed with ease of use in mind, our display stand makes graphics changes fast and simple. 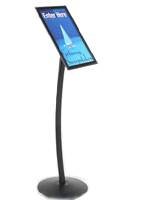 Lift the sides, top and bottom of the frame, insert your graphic, sign, or poster under the protective non-glare cover and just "snap" close. 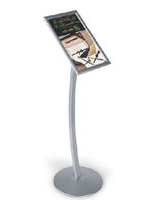 Our floor standing sign holder features classic european styling. 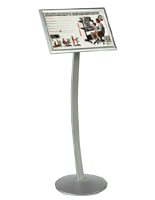 Display your advertisment, menu or custom printed, standard letter size sign in this satin aluminum floor standing display stand. 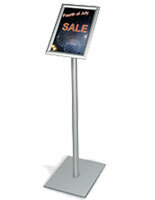 This floor standing sign, also called a standing sign holder includes all hardware needed for assembly. 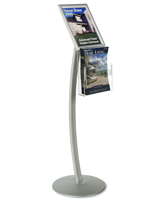 This floor standing sign holder is designed to hold one standard 8-1/2"w x 11"h letter size sign, poster or custom printed graphic.